The Foundation for Business Development (Fundempresa) reported yesterday that from January to October, the Amazon department of Beni registered a 7% increase in the number of companies, compared to the same period of 2016. 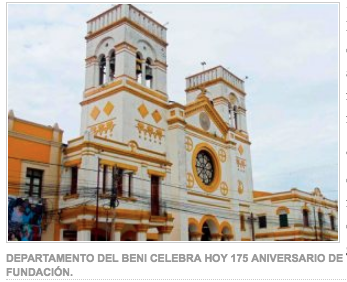 “The Beni department celebrates 175 years of its libertarian cry with 9,252 companies registering a growth of 7% compared to similar period of year 2016,” said ABI. Most of the Beni companies are engaged in trade, activity that has 3,331 companies, followed by that sector of construction with 1,751 and third place are 995 companies dedicated to the industry. Bolivian Thoughts opinion: Beni has great potential and beauty for sustainable development. Aside of the three sectors mentioned above. Ecotourism is by far the best alternative to overcome poverty. Current government needs to revert their illogical taxes on American and Israeli tourist. Rurrenabaque was booming with tourist until this sorry excuse of a central government decided to tax incoming tourists and now also intends to build roads in the middle of the TIPNIS and two dams in the vicinity of the Madidi. The Madidi National Park, is regarded as a hot spot in the world due to its amazing biodiversity. So, the answer is clear, this inept government of the coca grower caudillo has done more harm than good in the almost 12 years of absolute control of ALL State powers.